Maybe its the Austinite in me that likes to keep things weird, but every winter I have intense ice cream cravings (despite below-freezing temperatures). Because of this, my cold sweet tooth was thrilled when Dolce Neve opened its front doors on South First Street this January. I&apos;m everyone else will soon catch on. Dolce Neve serves gelato as it should be served: in heaping portions of perfect and creamy flavors. For those who don&apos;t know, gelato is the Italian version of ice cream. Despite its intense flavor and creamy consistency, gelato actually has less fat and fewer calories than ice cream, which means I can feel better about keeping up my New Year&apos;s resolution. 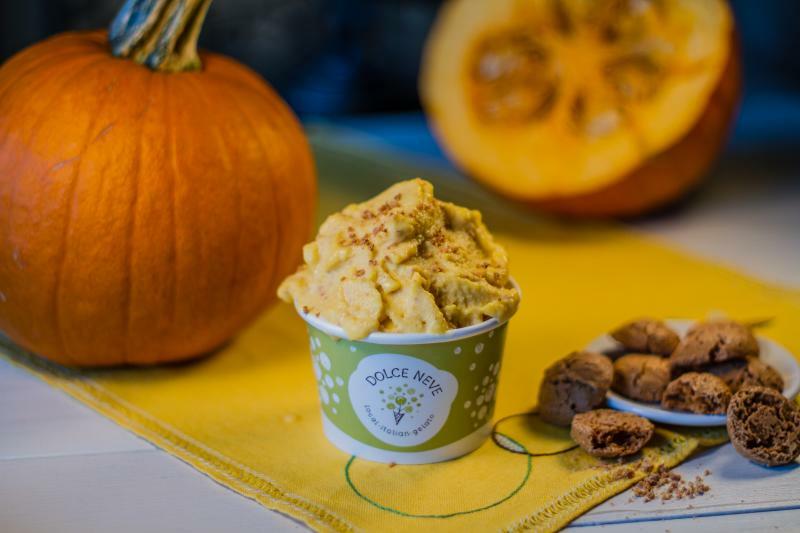 Dolce Neve offers 18 flavors of small-batch gelato a day, including vegan and milk-free options such as rice milk gelato. Their namesake Dolce Neve gelato has bright lemon and custard flavors, while the Pistachio and Honey flavor is on the savory side. Even the Hazelnut Rice Milk gelato maintains a creamy consistency to satisfy vegan and lactose-intolerant gelato-goers. Pumpkin and Amaretti. Courtesy of Dolce Neve. If you need a caffeine fix, Dolce Neve has excellent espresso and even offers affrogato, which is gelato drowned in espresso. The store offers other frozen options as well, including gelato bars and popsicles to go. Owners Francesca, Leo, and Marco make the gelato themselves in small batches right in the store. Francesca, who was formally trained in the fine culinary art of gelato in Bologna, Italy, is a world-class gelato artisan. For those who feel like living la dolce vita, Dolce Neve is located at 1713 S. First St., and has parking behind the store. They are open from 11 a.m. until 10 p.m. Tuesday through Friday, and 11 a.m. through 12 a.m. Saturday and Sunday. You can also catch them at the Austin Food and Wine Festival this spring. Contributed by Kelley Pettus, ACVB Marketing Intern.